TheRustedChain - The Blog: Forever. The other day I was driving home alone and saw the most beautiful sunset I'd ever seen. And I kept thinking, "Gosh, I wish I had my camera with me!" Then the radio dj said, "Turn up your speakers. Let's all sing this and worship our God together." It was something by Hillsong. I don't even remember what it was. But to sing that, driving in peace, and watching that sunset was an amazing moment. And I began thanking God for me not having my camera with me. I didn't have to think about settings, exposure, sharing it on my blog. I just had to soak in the moment. He was reminding me that sometimes it's okay to just have time alone with Him. He is forever faithful. Forever loving. This week, our two big kids are away at church camp. The Girl was fine with all of it, but she's been before. The Boy was a bit more concerned. "What if a kid just got really scared and wanted to go home? Could he?" I assured him he'd be fine. He said, "Oh I know... I'm just thinking for other kids." As we were eating breakfast before we left, he asked, "What about a nurse? Is there a nurse there in case someone gets sick or hurt?" He was just playing every possible scenario through his head. Slightly concerned, very excited, and a bit nervous. I miss them so much this week! But I know they will come home excited about our forever God. They'll meet new members of their forever family. Kids that they'll get to see for the rest of eternity. The house is quiet with just me and The Baby while The Man is at work. No tv. Just doing work and chores, taking care of my family. It's such a blessing to have been given. We listed this necklace in our shop yesterday. The necklace is simple & perfect. I hope you enjoy your quiet week & the kids enjoy camp. I'm sure it will be nice to have them back, too! What a great post! I think it is good to just stop and be in the moment. Of course I try rely hard to remember that when I am stuck behind a slow driver and all I want to do is get home!!! Love the new necklace as well!! Beautiful reminder of the things in life that really matter. Thank you for this quiet, reflective moment. Wow. What a great reminder of just being with God. Thank you! Ohhhhh Beki....that was an amazing moment! I love the whole scene...isn't God the best to give us little snipets of what heaven will be like....ohhhh so sweet! Thanks for sharing! Beautiful post.....I'm with you....sometimes it's better NOT to have a camera and we can just be in the moment. Glad you had a moment. Too cute about the boy and his ponderings. PS: The forever charm is beautiful and even more so when you explain YOUR thoughts of forever. Have a blessed day and enjoy your quiet time. I really love it, especially the clasp with it. oh I love this necklace. Its so simple. love it! I love the necklace and I love moments like that! Yes, yes, I hear you -- same thing happened to me with a beautiful sky and a dead camera battery. I think we talked about this already! Definitely a message from God -- I'm always processing experiences in my head -- can I use it for the blog? How will that photo come out? -- instead of really living them. p.s. I am going to make a necklace order...just can't decide. Simple n Sweet Looking Pendant!!!! I love that you ended up being happy to not have your camera. Although it is great to capture the moment, sometimes it is even better to simply live in the moment. And your boy, again, cute as can be. "I'm just thinking of other kids" Love it! I love that necklace, forever is my word to myself when I am missing Livvy because we are forever connected and one day soon we will be together forever. I've had the same experience of not being able to get a shot of a beautiful sunset and ending up very thankful that I didn't. Sometimes God wants our complete attention. 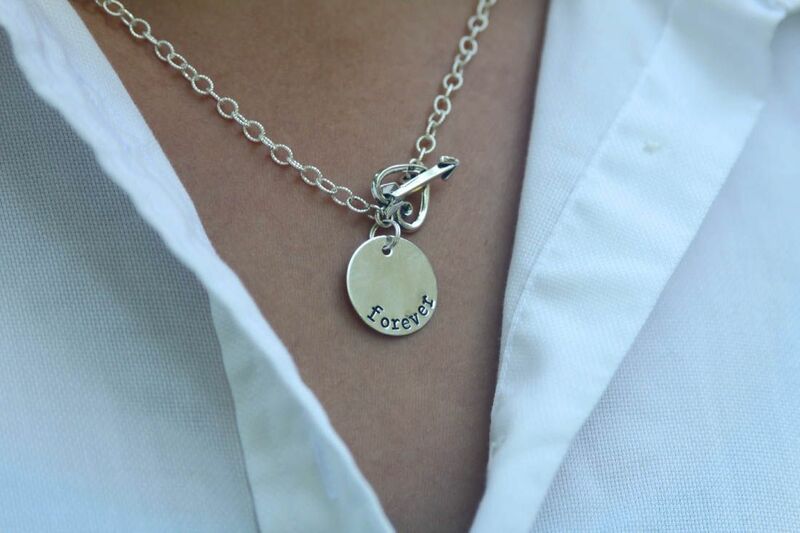 Love the Forever necklace...great gift idea for forever friends and family! ANYTHING by Hillsong would have been the perfect song for the setting! Sounds like God just wanted you to enjoy it for you. Don't you love little blessings like that? At our VBS this year, such an experience was called a "God Sighting". It's pretty cool when you notice all of the God Sightings in your life everyday. The necklace is beautiful too!